Plain and simple, nobody is great without work. Hard work is the baseline of great achievements and nothing spectacular comes without it. Having a vision, setting goals, making plans to achieve them, and staying on track is hard work. Not a single person on the Top 25 list is on it by accident. If you’re a part of our JohnHart family, you are here for a reason – a purpose bigger than just selling real estate. You are here because you care; you are here because you want to be an influencer; you want to make an impact! This quarter, we heard from 48 Laws of Power and The Laws of Human Nature author Robert Greene who spoke to us about the power of influence and how each and every one of us has the ability to influence those around us. If you’re not on this list, don’t be discouraged. There’s still a long way to go in 2019 and the fun has only just begun! Q1 was very exciting for JohnHart. We were named in the Top 0.1% of real estate companies nationwide by REAL Trends (read here) and in the month of March alone, we got 140 new listings and opened 178 New Escrows totaling over $125 million! 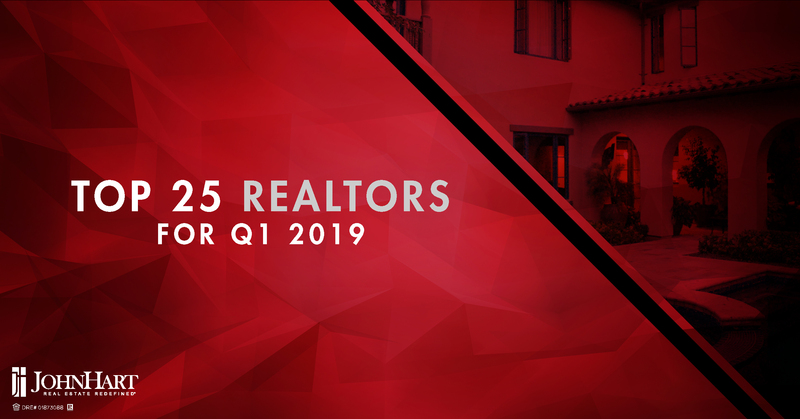 Q2 is set to be bigger than ever and as the biggest quarter in real estate, we are more ready than ever to dominate April, May and June and set some new records! One thing you will notice by looking at the list below is that it is comprised of experienced agents, young agents, and some pleasant surprises – but most of all you will notice that these agents are all 1) Committed and 2) Disciplined. They are on the Top 25 list because they aimed to be on it.